Keiji attempts to stop Toshiie from attacking Kenshin but his voice falls on deaf ears. Toshiie and Matsu arrive at Kenshin's front yard (so to speak) and Kenshin warns they should head back to Kaga. Kenshin has already sent half of his troops to Kaga to seize their land so Toshiie can't win this battle and it hasn't even started. They don't call Uesugi Kenshin the God of War for nothing. Though it could have been argued in the last season (since he didn't really do much in that season). 1) Kratos - Playstation's God of War that not only wields grafted chain blades but also giant amounts of angst and revenge in each hand respectively. 2) Himura Kenshin the Battousai (Kenshin Himura if you speak English) - The main character of Rurouni Kenshin that everyone in that series wants a piece of. An easy way to remember which one is which is that the last two are fictional. Fun fact of the day. Toshiie returns to Kaga to find the army Kenshin promised. Toshiie yells to charge through their lines. Halfway through the battle, Keiji arrives but he isn't here to help. Keiji and Toshiie have an intense fight that is probably the most confusing fight in the entire series simply due to the lack of blood (they show blood in the flashbacks during the same fight so it's confusing why they are so selective of what they censor). Despite that, it's still intense and enjoyable so get to watching. I'll let you see for yourself who the victor is. Regardless of who stands, no one actually wins in a fight between family or friends. Then we see a depressing scene of Masamune standing among bodies as he yells in desperation for his men to wake up. It's obvious they've been fighting for over a day at this point (possibly longer) and while many lay dead, some manage to stumble their way back up to join their leader. 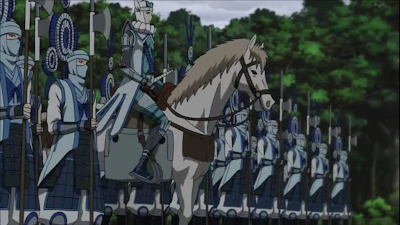 Just as they plan to head back, Hideyoshi shows up. Then we see what progress Yukimura is making before he begins hearing the haunting cries of a woman. 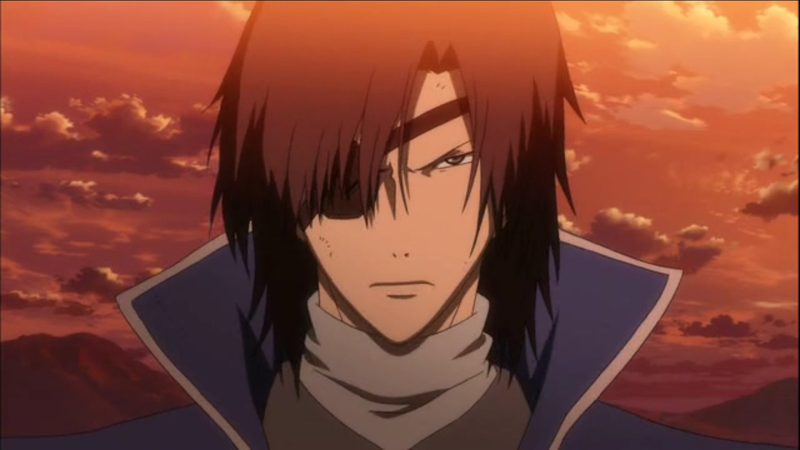 A very familiar voice reaches Yukimura's ears, "It's Ichi's fault." THREE CLIFFHANGERS FOR THE PRICE OF ONE EPISODE! This is Kylak signing out and wondering if Kenshin will ever truly get to fight in this series.